An album of drawings by 18th Century painter Thomas Gainsborough has been discovered in the Royal Collection at Windsor Castle. The drawings had been misattributed to another artist, Sir Edwin Landseer, since the reign of Queen Victoria. But after studying the 25 black-and-white chalk sketches, historian Lindsay Stainton confirmed they are actually early works by one of Britain's most famous painters. "It's thrilling," she told the BBC. "It's the very best collection of Gainsborough's early drawings in existence." Thomas Gainsborough was born in Sudbury in Suffolk in 1727. He drew the sketches of places he knew in the area when he was in his early twenties. The sketches depict trees, cattle, paths, ponds and sandy banks. "He was obsessive," says Stainton. "Nature was his teacher, and the woods of Suffolk his Academy." The drawings have been kept in a large, blue, leather-bound album on a shelf in the Print Room at Windsor Castle since 1874. They were attributed to Landseer, the English artist best known for making the bronze lions in Trafalgar Square. When Stainton examined the sketches, she soon became convinced they were by Gainsborough. She compared them to other works by the painter and noticed striking similarities. "One comes to the conclusion they must be by him," she says. The most decisive proof lay in an early study of Cornard Wood. When Gainsborough's sketch is overlaid over the finished picture that hangs in the National Gallery, it "morphs completely" into it. "It is the preparatory drawing for the painting," concludes Lindsay Stainton. 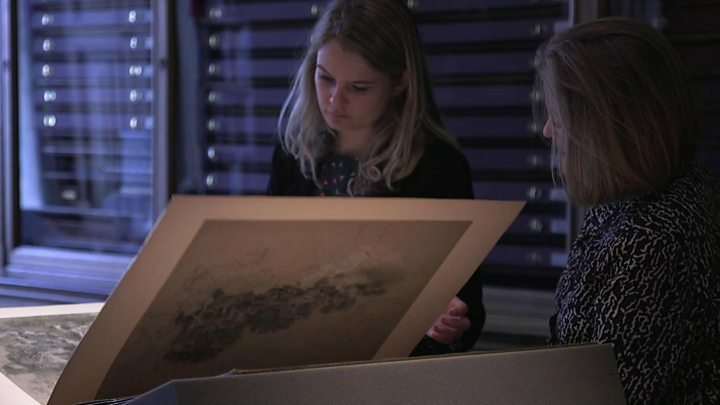 "We're very much convinced that these are an important group of early drawings by Thomas Gainsborough," agrees Rosie Razzall, curator of prints and drawings at the Royal Library. "It's an extremely significant discovery. It means we are able to re-appraise the early work of Gainsborough." And there was a surprise in store. A small drawing of the head of a young woman has been discovered on the back of one of the sketches. "This is very much in Gainsborough's early figure style," explains Razzall. "We know from other early figure drawings that this is how those drawings would have looked." James Hamilton, whose biography Gainsborough: A Portrait is published next month, thinks the sketch of the woman, wearing a little headscarf, might even suggest Gainsborough was not always alone out in the countryside. The informal sketch of the girl "may well be Margaret Burr", he says, referring to the woman Gainsborough was going out with at the time and went on to marry. "There is a kind of similarity in the facial features," he adds. Gainsborough defined an age in his portraits, which include The Blue Boy and his famous double portrait Mr and Mrs Andrews. Painted in 1750, the latter hangs in the National Gallery. But James Hamilton believes: "Portraits bought him money, landscapes gave him joy." The drawings are now available to view on the Royal Collection website.